Mansfield is a town still traumatised by the death of Charlotte Avenall - an eight-year-old girl with severe learning difficulties who was found hanging in her bedroom last September. Her parents Susan and Simon Moody have always covered their faces from the media attending court, and refused to release a single image of their daughter. But police photographs of the room where they found her body showed the terrible conditions in which she lived, and died. Bereft of carpets and curtains, and with piles of excrement and pools of urine everywhere, Charlotte was locked in every night. The couple admitted in police interviews they had not set foot in the room for four to five weeks. Detective Superintendent Adrian Pearson was one of the first on the scene. He said he would never forget what he saw. "The scene was an absolute tragedy. It was appalling to think that a small, eight-year-old, disabled girl had been kept in these conditions. "We found a room devoid of all carpets and curtains, she was locked in there every night. I was hugely shocked." Mr and Mrs Moody, aged 33 and 24 respectively, were questioned under caution at the family home in Moor Street, Mansfield, by police who attended the scene. The couple were later arrested and charged with neglect. Both admitted wilfully neglecting Charlotte, in a manner likely to cause unnecessary suffering or injury to health, between 14 August and 12 September last year. While Mrs Moody accepted she was Charlotte's primary carer - although claimed she was ill during the four weeks detailed in the charge - the prosecution said both parents had a duty of care. It's horrible and I wish I had done something, but how could anyone really know? Giving his assessment of the couple, Det Supt Pearson said: "It was absolutely atrocious to think that in this day and age there was a little child, let a lone a disabled one, kept in these conditions. "Downstairs we saw parents who had a large collection of tropical pets, which clearly needed an awful lot of care and attention, and yet upstairs there was a small child locked away every night." Scores of people queued to pay their respects when Charlotte was laid to rest last month. Now her mother and stepfather have been dealt with by the courts for the appalling neglect she suffered, people's shock about what happened has turned to determination to make sure it can never happen again. The elected Mayor of Mansfield, Tony Egginton, summed up the questions many people in the town are still asking. "I can't believe it, I don't think anybody could. But the reporting process has to be questioned if somebody had been out on a regular bases to see the family in their environment and they have not picked up on the issues, which were obviously very very far reaching. "It beggars belief," he said. Susan Moody was 16 and in foster care when she gave birth to Charlotte, who had severe learning difficulties and mobility problems. Due to her mother's age and background, social services and other care agencies were involved with the family from the time she was born. 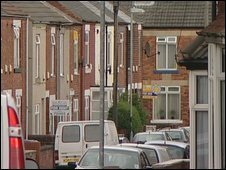 Nottinghamshire County Council has confirmed a Serious Case Review is under way. A summary of its findings will be published in a few months, after the election. A spokesman would not comment on claims from public service union Unison that social workers working with children in Mansfield had excessive caseloads at the time of Charlotte's death. When asked the council also refused to be drawn on whether any staff had been suspended as a result of their own investigations. Police say the child had been to school the day before her body was found and had been doing well in mainstream education at Birklands Primary School in Warsop. Neighbours spoke of a friendly little girl, but said they didn't see her very often. One couple, Doreen and Albert Harby, whose house backs onto what was Charlotte's bedroom said they had suspicions "something was not right" when the window was painted out. Mrs Harby said: "There was always a light on, just a single light bulb, and after a while you could see little holes scratched out, but as they got bigger it would be painted over again. "We had no idea who was living in there and now it's not very nice to think what was going on, under everyone's noses. "It's horrible and I wish I had done something, but how could anyone really know?"